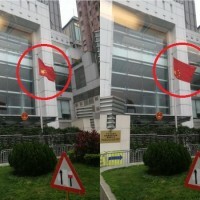 Chinese symbol for "tear down" over photo from Wei Wing-jen's Facebook. 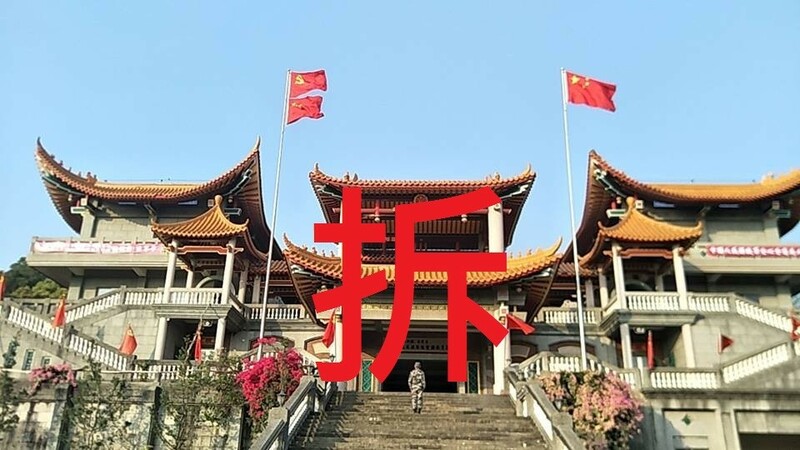 TAIPEI (Taiwan News) -- After the New York Times drew worldwide attention to a Buddhist temple which has been converted into a Communist Chinese shrine in western Taiwan, the Changhua County Magistrate has had enough and today announced that power and water has been cut to the illegal structure, and it will be demolished after the Mid-Autumn Festival holiday. At a press conference today, Changhua County Magistrate Wei Ming-ku (魏明谷) said that after the New York Times article drew attention to the fact that the former Biyun Chan Temple (碧雲禪寺) in Changhua’s Ershui (二水) Township has been converted to a Communist Chinese shrine, it brought "shame to Taiwan." In response, he is ordering that power and electricity be cut to the illegal structure and that it be torn down next week. Wei said that he has directed Taiwan Power Company (Taipower) and Taiwan Water Corp (Taiwater) to cut power and water to the building as of 2 p.m. this afternoon. Wei said that the county government will then forcibly demolish the illegal temple at 10 a.m. on Wednesday, Sept. 26, and police will be dispatched to the scene to maintain order. 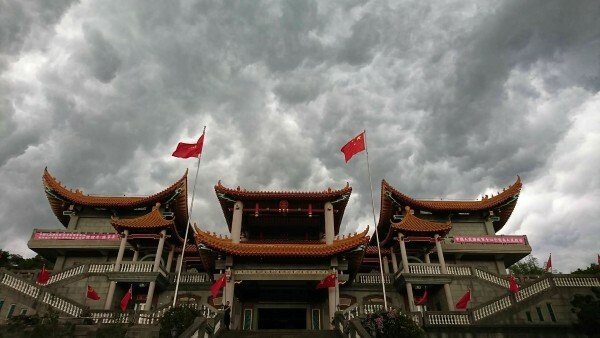 Wei said the illegal occupation of the ancient Biyun Chan Temple by construction contractor Wei Ming-jen (魏明仁) and the way he turned it into a political propaganda tool by calling it a "Patriotic Education Base," has caused international concern. 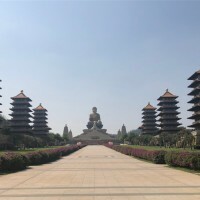 Wei said he and the county government strongly condemn the illegal temple for harming the nation's dignity and the people's feelings and for causing much trouble for Changhua residents. The Changhua County Government pointed out that the illegal building covers an area of about 2,500 square meters, while the actual historic remains of the Biyun Temple only cover 185 square meters. The government claims that the illegal structure never received authorization to receive water and electricity. Responding to criticism over the country government's slow reaction to the case, Changhua's magistrate said that it was not that they did not care, it was that they waited until the Cultural Affairs Bureau held a cultural resource review meeting on Sept. 11, when a discussion was held over the fate of the historic Biyun Chan Temple, reported Liberty Times. Magistrate Wei said that it was at this meeting that appropriate measures regarding the historic building were decided on in accordance with the law. As first reported by Taiwan News in April, Wei Ming-jen, a 60-year-old retired military officer construction contractor, evicted the four nuns who lived 100-year-old Biyun Temple (碧雲禪寺) in Chanhua County's Ershui Township, after duping them into accruing a large amount of debt he claims they never fully repaid. Wei's takeover of the temple started with an addition that the nuns requested him to construct. 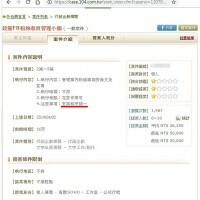 Wei charged the nuns a massive sum of US$3.2 million (NT$98 million) to construct the addition, which they claimed they repaid in full in the form of installments over several years, according to the New York Times. 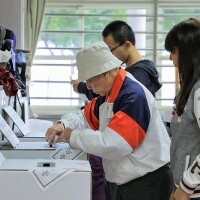 However, the New York Times report cited the nuns as saying that an elderly member of the order had been tricked by Wei into signing promissory notes for additional debt that the nuns did not owe him and that they ultimately were unable to repay. After a court ruled in favor of Wei and following a public auction, he took control of the temple and kicked out the nuns in 2012. Once he took over the temple, Wei covered it with the flags of China and the Communist Party, and stocked the interior with portraits of Mao Zedong, Zhou Enlai and Xi Jinping. 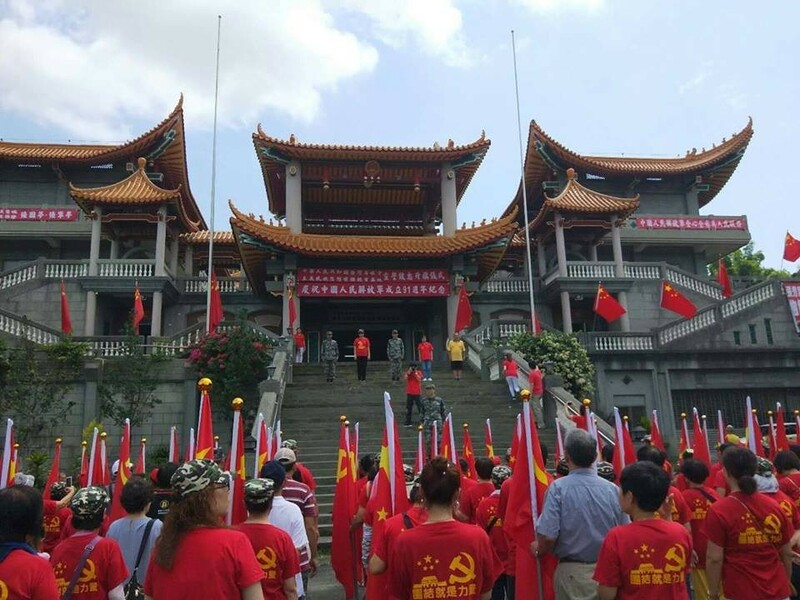 Photos of pro-Communist China rallies held at the temple-turned Communist propaganda compound by his ragtag band of elderly supporters can be seen on Wei's Facebook page. Meanwhile, the nuns have been forced to live in shipping containers next to the temple and they have plastered all the bills they claim to have paid to Wei on the wall that separates them from their former home. Villagers have scrounged some funds to help them build a tiny, makeshift temple in one of the containers, but attendance is said to be low.